An elegant painting against a soft pink background encompasses this product claiming to balance hormones, support the glandular system, and provide day and night protection. 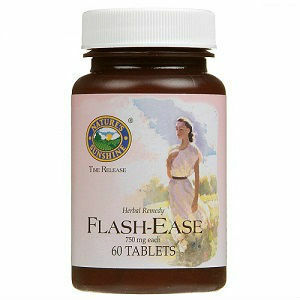 Flash Ease has been carefully crafted to provide women in menopause with the support they desire. However, is this product any better than other menopause supplements on the market? According to reviews, many women say yes. Due to the success rate of this supplement, Flash Ease deserves a closer look. Users of Flash Ease are directed to start dosages at ½ a tablet in the morning and at night. After the first week, dosages are increased to 1 tablet in the morning and at night. There is no indication if tablets should be taken with food or water. Flash Ease can be purchased on Nature’s Sunshine’s website for $23.95. With purchase, customers will receive 60 tablets, equivalent to a 30 day supply. Customers considering this product should be aware that a discount is provided for those who become a member of Nature’s Sunshine. The Flash Ease price for members is $15.95, a savings of $8. While researching this particular product, a 100% satisfaction guarantee was found to be associated with all Nature’s Sunshine products. However, there is no indication of how this exactly applies to returns and unsatisfied results. Will Nature’s Sunshine return the money? If so, will it be 100%? A company should always provide a clear statement of what their guarantees cover. Although it seems numerous women have found relief from menopause while using this product, there are a couple of elements which should be of concern to potential users. First, it should be a slight concern that the beneficial claims of this product are rather vague. It is stated that Flash Ease will promote hormonal balance. However, it is not clear as to how thorough the balance will be. Because specific benefits are not listed, women may buy a supplement that only has the potency to relieve a fraction of their symptoms, thus creating the need to buy other supplements. A second red flag for this product is the vague guarantee. Because Nature’s Sunshine does not specify as to how they will uphold the 100% satisfaction guarantee, users are taking a risk. Often this form of guarantees does not ensure a full refund for dissatisfaction; commonly, they only include an exchange or partial return. Jackie Horowitz	reviewed Nature's Sunshine Flash Ease	on April 28th	 and gave it a rating of 2.